Updates 03 Feb 2011 08:34 am by David ! But we’ve since learned that if you publish a book at the very end of October and if you don’t provide advance copies to anybody, it means you will probably be too late to be considered for anybody’s “best of the year” list. (We only qualified for Amazon’s top ten customer favorite list by a scant five days!) It also means that people won’t necessarily have time to read your book before they have to nominate stories for many of the year’s awards. Well, luckily there are at least a few awards still taking nominations, and they’re some of the big ones! The Nebulas: The Nebulas are selected by the members of the Science Fiction Writers of America (SFWA). Most members are eligible to nominate stories in length-based categories through February 15, 2011. The top six vote-getters in each category will then proceed to the official ballot, which active members will vote on. The Hugos: These are selected by the attendees of Science Fiction Worldcon. Nominations are open until March 26, 2011, but in order to have your nominations counted you will need to confirm your eligibility by January 31, 2011. Details on how you become eligible are here. Unfortunately, neither the Nebulas nor the Hugos have an anthology category, so the book as a whole doesn’t really fit anywhere on their ballots. However, if you’re eligible to nominate or vote for either of these awards, we ask you to keep our writers in mind for the short story and novelette categories. If you haven’t finished reading the book yet, we as editors would suggest you look at and consider “ALMOND” by John Chernega for the novelette category (over 7500 words) and “LOSS OF BLOOD” by Jeff Stautz for the short story category. A free PDF of the entire book (including both of these stories) is available for download here. Updates 22 Dec 2010 01:54 pm by David ! Pic from Barnes & Noble, Evanston IL. 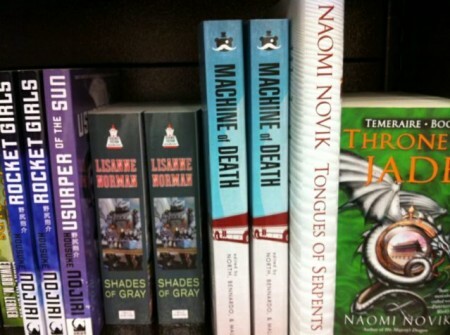 • @trislegomenon: Elliot Bay Books in Seattle has copies of Machine of Death on display at the front of the store. I don’t have pictures though. This is a first step. In conversations with our distributor and in their conversations with the retailers, we’ve discussed promotions, ways to get it onto the front tables and very visible places. When you see books placed prominently by the front door of a big bookstore, or on the endcap of an aisle, usually that’s the result of a “co-op” agreement, where the publisher pays the bookstore for the favorable real estate. (It’s also kind of a sneaky way for the bookstore to make money whether or not the books ever sell. They can always return unsold books to the publisher for a refund, but of course they keep the co-op money.) Our distributor is helping us decide how much co-op money, if any, we want to spend and what kinds of deals the bookstores will give us. The bottom line is that the better the book does for the store, the nicer they will be to us. We’ve also started the gears turning towards higher-profile press and review coverage. (Please contact us if you would like to write an article about MOD for the press. We give excellent sound bites.) We anticipate that the bulk of that coverage will fall in January, and we presume that increased sales will result in more thoughtful store placement as well. It is currently on display at: the Books with Buzz Wall on the first floor. The Staff Picks wall on the second floor. In section at Sci-Fi/Fantasy Anthologies on the third floor. Ryan is also working to possibly set up a signing in Toronto sometime in the new year! • Indiebound is an online bookstore that allows you to purchase from independent booksellers in your community (or anywhere) if you’d rather your money not go to monolithic megacorporations who desperately need your money to stave off bankruptcy. They now list MOD in their catalog and can help connect you to indie bookstores in your area who can either sell you the book online, or order it for you to pick up in-store. • The Book Depository is another online bookstore. Based in the UK, The Book Depository’s main gimmick is free online shipping worldwide. Like Kinokinuya, mentioned in the Facebook thread above, TBD is an international bookstore, meaning they import books from various markets and sell them in other markets. We do expect to have traditional distribution set up in the UK/Australia/NZ next year, although it may be a few months before all the pieces settle into place. It may also make it to some non-English-speaking countries as well, though we can’t say for certain. In the meantime, The Book Depository has MOD in stock and will ship it to you anywhere in the world (including the US) for free. Have you seen MOD in a local store? 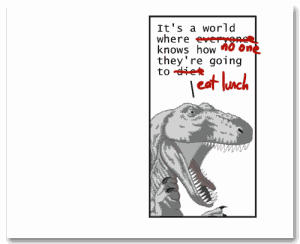 Especially a non-chain store? We’re always keen to hear how broad our reach is! Leave us a comment and/or post a picture on our Facebook! Updates 10 Nov 2010 11:46 am by David ! MOD is coming to US bookstores! Help us get it right. 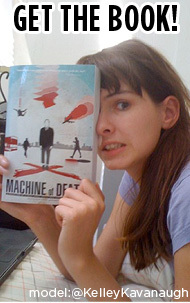 Today we’ve signed a deal that will bring Machine of Death into bookstores across the United States. We’re talking Barnes & Noble, Borders, indies, airports — this deal will make it available to everyone. We are negotiating Canadian and UK distribution as well. In the next few weeks we’ll be focusing on making sure the bookstores who stock our book don’t regret their decision. But there’s one very important, very mechanical task in front of us right now — one you can help with! We’re going back to the press with a new printing of the book, and we want to take this opportunity to fix the handful of typos that crept into the manuscript. After the jump we’ve compiled a list of the ones we’ve found so far. (Some of these have already been fixed in the digital versions.) We want the next printing to be perfect! So please leave a comment with any others we may have missed, and we’ll update the post accordingly. We only have a day or so to make these changes, so we’re hoping you can help — if nothing else, verify that we’ve caught everything! UPDATE: Thanks so much for your eagle eyes! We’ve made notations as to the corrections in the comments. We are preparing your prizes this weekend and will be announcing them soon!